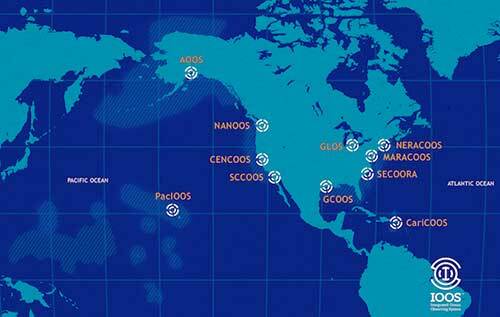 The IOOS Association is a non-profit organization that supports the US Integrated Ocean Observing System (US IOOS) to provide to quality and timely information about our oceans, coasts and Great Lakes. The Association works with the 11 IOOS Regional Associations and the Federal partners to create a national network that meets the diverse needs of user across the nation. Each of the 11 Regional Associations design, maintain and operate regional coastal observing systems and develop information products for their users. Click on the icon to explore the regional coastal observing system near you. Please save the date for the 2019 IOOS Association Business Meeting on September 20, 2019 in Honolulu, HI. The meeting will include a debrief from the week's OceanObs'19 international conference. The IOOS Association thanks all those who were able to attend the 2019 IOOS Spring Meeting in Washington, D.C. Click here to read the meeting highlights.